The time is now for the New York Islanders. For a franchise that still doesn't have a deal in place for a new building, it is imperative that the Islanders accelerate what has been a slow and steady rebuilding process and qualify for the Stanley Cup Playoffs for the first time since 2007. Interesting fact: At 20 years old, John Tavares led the Islanders with 67 points this past season. This makes him the youngest Islander to reach 60 points since Bryan Trottier scored 95 points as a 19-year old rookie in 1975-76. GM Garth Snow believed he had assembled a playoff team last summer, then watched his top defenseman (Mark Streit) and power forward (Kyle Okposo) suffer serious shoulder injuries before the puck even dropped on the 2010-11 season. Now fully healthy, the Islanders boast a young, talented core that is eager to put the franchise back on the map. With their top blueliner back in the mix, this group -- headed by John Tavares -- could be one of the surprise teams in the Eastern Conference this season. Let's not forget that New York went 25-21-8 over its last 54 games. Snow wasn't a big player in free agency, but he did improve his club up front. 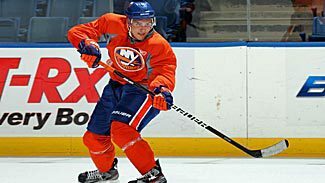 The Islanders signed Marty Reasoner to replace Zenon Konopka on the first day of free agency and more recently acquired Brian Rolston from the New Jersey Devils in exchange for Trent Hunter. Both Reasoner and Rolston are quality veterans who are expected to contribute both on and off the ice. 1. Does Nino Niederreiter make the team? The No. 5 overall pick in the 2010 NHL Entry Draft, Niederreiter had a nine-game stint in the NHL last year before being sent back to the Western Hockey League. Look for Niederreiter to make the club this season. 2. Can the Islanders break out of the cellar of the Atlantic Division? The Islanders have finished in the basement of the Atlantic Division each since a playoff appearance in 2007. Although they haven't improved much in the standings, the future of the team hasn't looked this bright in a long time and it's only a matter of time until the team is competing for a playoff spot, which could be as soon as this season. 3. How will the return of Mark Streit and Kyle Okposo impact the team? Islander fans were hoping this past season would mark a return to the playoffs for the first time since 2007. Before the year even began, though, struggles were found as defenseman Mark Streit was lost for the season and forward Kyle Okposo missed several months with shoulder injuries. Okposo played toward the end of the season and looked strong, while Streit is expected to be ready in October and should have a positive impact on the Isles' playoff hopes. The last two players from the Islanders' big turnaround back in 2001-02 are no longer with the club. Radek Martinek, who was New York's eighth-round selection at the 1999 Entry Draft, signed as a free agent with the Columbus Blue Jackets in July. 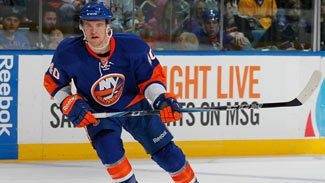 Often sidetracked by injuries, Martinek has appeared in 453 NHL games, all with the Islanders. Meanwhile, Hunter, who made his Isles' debut during that pulsating 2002 first-round series against the Toronto Maple Leafs, was dealt to New Jersey on July 28 -- and his contract was almost immediately bought out by the Devils, making him an unrestricted free agent. Two key veterans from last season -- Doug Weight and Konopka -- are also gone. Weight announced his retirement in May after 19 seasons and will remain with the organization as an assistant coach and senior adviser to Snow. Konopka, who appeared in all 82 games for the Islanders last season, signed with the Ottawa Senators as a free agent. Also gone are defensemen Bruno Gervais, who was traded to Tampa Bay, and Jack Hillen, who recently signed with Nashville. Depth forward Jesse Joensuu also opted to play in Sweden. The most important newcomer is Rolston, who gets a fresh start with the Islanders after a rough season in New Jersey. Now 38, Rolston, a four-time 30-goal scorer who is closing in on 1,200 NHL games, will get every opportunity to play the point on the power play and be one of the Isles' top six forwards. More important -- he'll be a calming influence and an important voice in what remains a very young dressing room. Reasoner will be the club's fourth-line center who is capable of contributing offensively. The 34-year-old appeared in all 82 games for the Florida Panthers last season and tallied 14 goals and 18 assists. His arrival makes New York very solid down the middle along with Tavares, Frans Nielsen and Josh Bailey. The Isles' blue line also receives a huge boost with the return of Streit, who missed the entire 2010-11 season after suffering a shoulder injury during training camp. One of the better free-agent signings in the summer of 2008, Streit racked up 105 points in his first two seasons with New York. Michael Grabner -- The speedy Austrian burst onto the scene during the second half of last season after being plucked off waivers from Florida in October. A finalist for the Calder Trophy as the League's top rookie, Grabner led the Isles and all first-year players with 34 goals. Six of those tallies came shorthanded, while only two were scored on the power play. Mark Streit -- Easily one of the most underrated defensemen in the League, his season-ending injury last September was devastating in many ways. Now healthy and eager to make the Islanders a playoff team again, Streit will be relied on to play roughly 25 minutes per game and quarterback the power play. Nino Niederreiter -- The fifth pick at the 2010 Entry Draft, Niederreiter was solid enough in training camp to earn a nine-game audition at the NHL level last season. He scored his first goal in front of a national TV audience at Washington on Oct. 13 but was eventually returned to Portland in the Western Hockey League, where he had 70 points (41 goals, 29 assists) in 55 regular-season games and 27 points (9 goals, 18 assists) in 21 playoff contests. Snow also added some depth to his AHL club in Bridgeport with the signings of forwards Tim Wallace and Sean Backman. Wallace has 24 games of NHL experience on his resume, all with the Pittsburgh Penguins. He had 20 goals in 62 games for AHL Wilkes-Barre/Scranton last season. Backman, who is Matt Moulson's brother-in-law, had 23 points in 67 games for the Texas Stars in 2010-11, his first professional campaign. The Islanders are closing in on two decades without a playoff-series victory. Can they change their fortunes in 2012? Perhaps, but it will likely depend on their goaltending. Rick DiPietro enters training camp as the No. 1 goaltender, but his 26 appearances last season were the most he's made since the 2007-08 season. DiPietro, who will be 30 when the season begins on Oct. 8 against Florida, went 8-14-4 with a League-worst 3.44 goals-against average and .886 save percentage in 2010-11. If he stays healthy, those numbers will need to improve drastically for the Islanders to have any chance of making the playoffs. After all, the other starting goalies in the Atlantic Division are Henrik Lundqvist, Martin Brodeur, Marc-Andre Fleury and Ilya Bryzgalov. Al Montoya was impressive in his two-month stint in New York after being acquired from the Phoenix Coyotes in February. A first-round pick of the Rangers (No. 6 in 2004), Montoya went 9-5-5 with a 2.39 GAA and .921 save percentage in 20 games with the Isles. And let's not forget, Evgeni Nabokov is still Islanders' property and he fully intends to report to training camp. If nothing else, reporters will have something to write about come September. If the goaltending is solid and the team's top players manage to stay out of the infirmary, the Islanders could be ready to take that elusive next step. It's time things go right for a franchise that is desperate for good times.